I have taught first grade for the last 12 years, and it seems like every year I get questions about what we do during our “Choice Time.” The number one thing that my students learn how to do during playtime or choice time is learn how to problem solve. My student’s favorite choice is the blocks. Here you see some children building with blocks, but what else are they doing. They are learning about spatial reasoning, using geometry, comparing heights and inclines, among many other things. 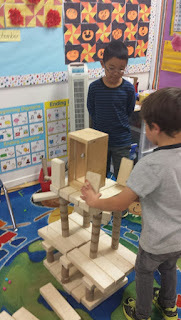 Not only are children learning how to share and work together during playtime, but they are becoming the engineers of the future. I often overhear my students discussing how they can change the angle of their ramp to make the cars go faster or how to make their tower taller by building a more stable base. They also like to “shop” around the room to find things to add to their structures. “Let’s use this toilet paper roll to add a tunnel for the cars to drive through!” or “Let’s use the counting bears to have customers at our hotel.” The play is collaborative, creative, and inventive. I encourage everyone to find what’s right for his or her class and allow time for students to explore. Do all of my students choose blocks? No, but they do all chose something to investigate, discover or create. Mini whiteboards to record math problems, scarp paper bins to create masterpieces, note paper to write messages, and math manipulatives to find new purposes for are all things that we already have on hand in class that my students gravitate to on different days. There is no limit to what they can come up to do during our “Choice Time” and my best answer to what they are doing during this time is learning.